The Kuhl Thrive longsleeve ™ Shirt features a special 3D microfiber nylon designed to keep fabric off your skin for cool comfort and performance. 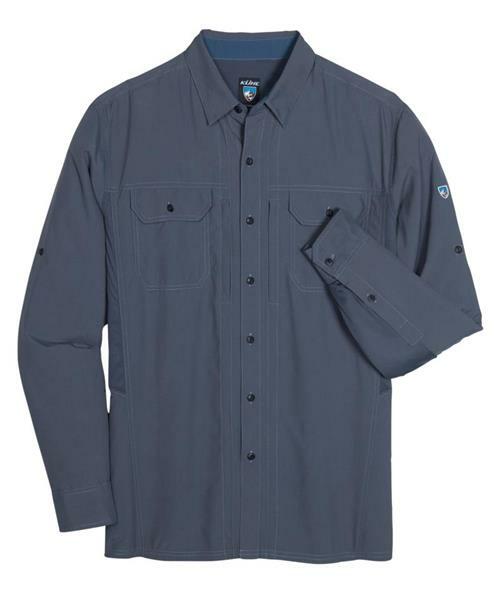 This exclusive fabric is abrasion resistant and UPF 50. Strategically placed Konclear™ mesh panels on the sides and under the arms increase airflow and comfort with a mesh so fine it can't be easily detected by the casual glance. The Thrive longsleeve features a button-down collar, button front, 2-button adjustable cuff and 2 button-down chest pockets. The sleeves can be rolled up and secured with the button tab, and a built-in custom chamois sunglass cleaner is sewn inside the bottom left placket.